On Sunday, we wandered up the street to our (very… just a few blocks away) local farmers market on its first day of the season. Things are just starting to thaw out around here, so it’s still relatively early for most fruits and vegetables… but we were able to make off with some of the prettiest (and tastiest) late season sweet potatoes I’ve ever seen. I don’t usually think of sweet potatoes as a spring vegetable, but here in Maryland they’re still managing to turn a few up. And that’s good news for us, because they’re one of our favorite staples… and silly me I thought they were long gone. I was so excited to bring that bag of orange beauties home I went to work right away to dream up a tasty, slightly more spring-y, way to use them… and since Cinco de Mayo is almost upon us (and also since tacos are pretty much my most favorite food ever) I decided to roast the little guys up and pair them with some fresh ingredients and a good creme fraiche. 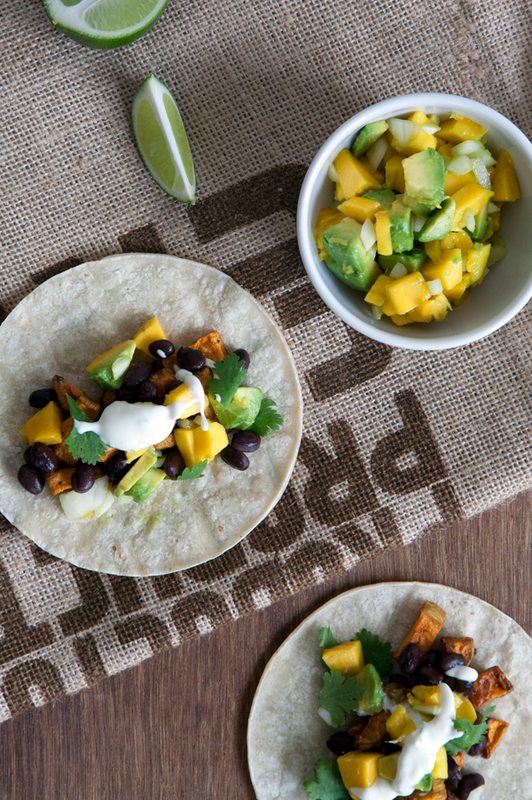 The result, with the addition of a little avocado, jalapeño, and the sweetest mangoes ever (Mark, that genius man, brought those into the mix) is a sweet, savory combination that we’ll be keeping on heavy rotation anytime we can find both sweet potatoes and mangoes in supply. So, May… but what better way to welcome in spring and transition to summer than with this perfect combination of winter and summer flavor? Mix sweet potato, olive oil, and jalapeno in a small bowl with a dash of salt and pepper. Spread evenly on a baking sheet and place on middle rack to roast. Cook for approximately 20 minutes, until sweet potatoes are soft and crisped on the edges, flipping with a spatula halfway through. In a separate bowl, mix black beans with a dash of salt and set aside. Dice mangoes, avocado, and onion and mix in another small bowl. Squeeze one whole lime into the bowl and mix. Set aside. Mix creme fraiche, heavy cream, lime zest, and juice of second lime together in a third bowl. 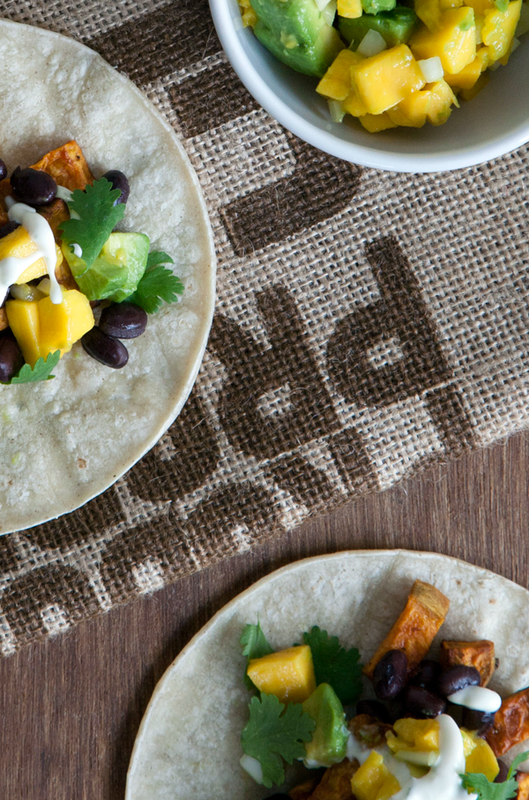 Remove sweet potatoes from the oven and toast tortillas, one at a time, in a skillet over medium-low heat. 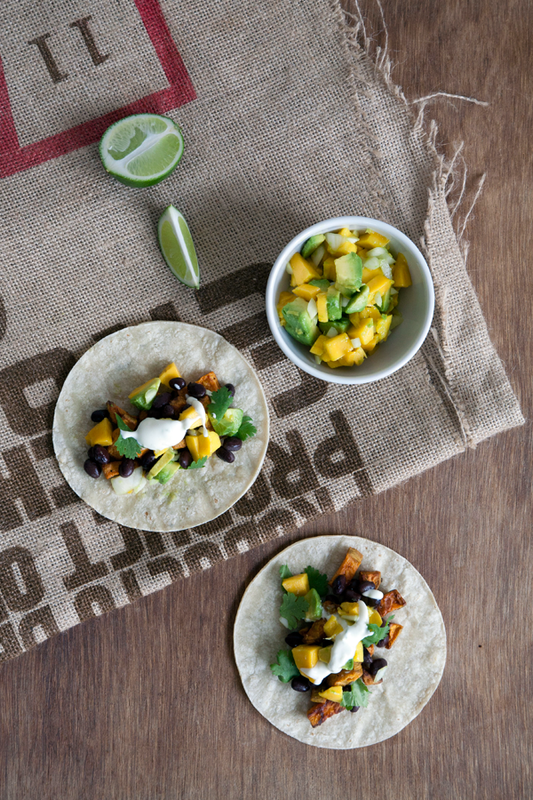 Assemble each tortilla: sweet potato, then black beans, then mango chutney, then a drizzle of creme fraiche. Garnish with cilantro. These look soo good!! Totally making them this weekend! I will be making this next week! 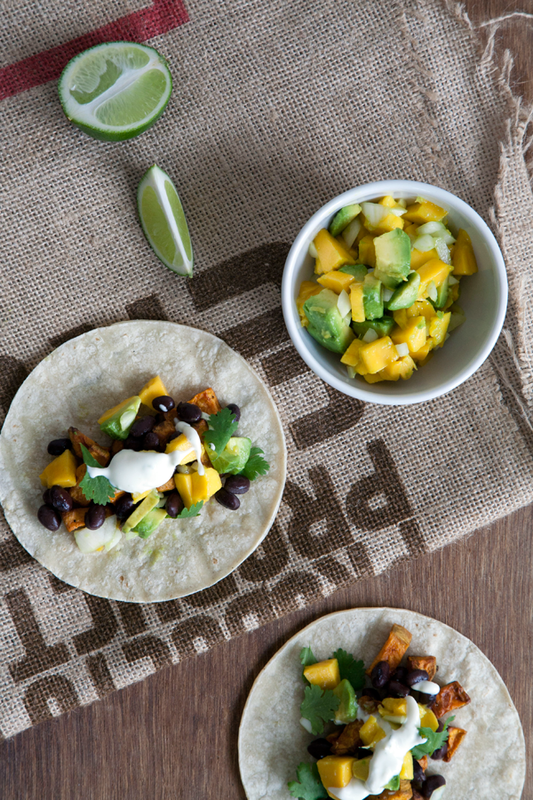 What a perfect supper–Tuesdays are for tacos in our house! you never fail to make me drool with your food posts! is it weird that I’ve had home made crab cakes on my mind for a very long time, ever since you posted your recipe? SO SO good!! I am loving this combo. 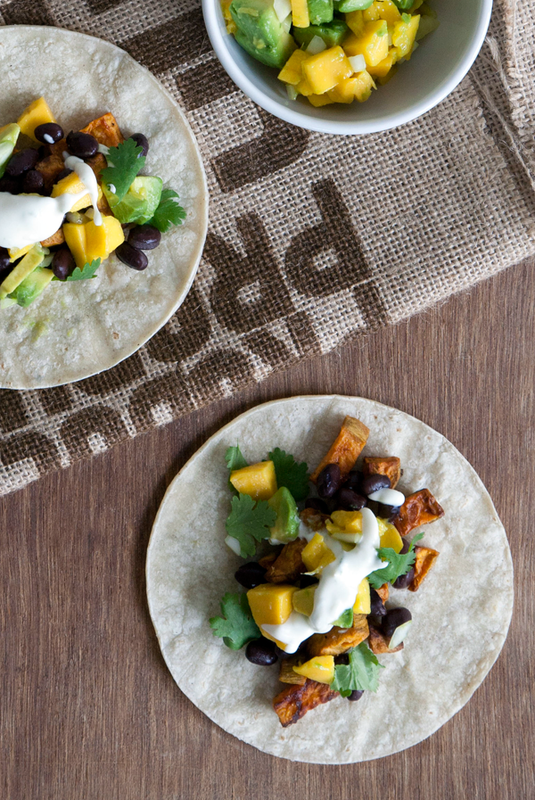 Need to make this on my next taco night…thanks for the recipe lady!